Life at Pemberley: Get Your Mug On! Yay! Today is August 1st, which begins the most wonderful five months of the year! Birthday season is officially upon us, Autumn is on its way, and Thanksgiving and Christmas, along with cooler weather, are on the way! Praise Jesus! I kept singing "It's The Most Wonderful Time Of The Year!" song around the house last night and poor CC could NOT stop rolling his eyes. Crazy man. What makes this time of year even better, you ask?! 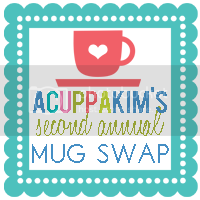 CuppaKim's annual MUG SWAP is back! Woohoo! This was such a blast last year! It was my first blog swap I participated in and I LOVED it! I got to know two awesome ladies, Carrie and Hannah. (Hannah makes the cutest earrings on Etsy if you want to look super cool and fashionable.)! I also got to be better friends with the famous Kim, and of course, she's awesome too, so I loved it! Oh, did I mention I got a super cute turquoise mug from Carrie out of it? I think of those three ladies EVERY. TIME. I use my mug. How cool is that?! So I have already responded that I'll of course be joining up for this year's awesome mug party. Jump on board with us! Anyone can participate and I promise you'll have a blast! And in case you missed my post about helping Hope4Sudan, please check here for more info. They're halfway to the goal, but these people are hungry and need food TODAY. Or, yesterday even. Let's join in and help show them Jesus! What a fun idea!!! Ok, might have to do this! I'm in this year! Just signed up. Can't wait!!! Thanks for making sure we were in the loop!! Please Read-- Big Bloggie News!